Here's another hint: It is featured on one of Mill Creek's horror packs. those basement scenes with the demons disguised as Colonial people. The Larry Buchanan version of WOLVERINE? 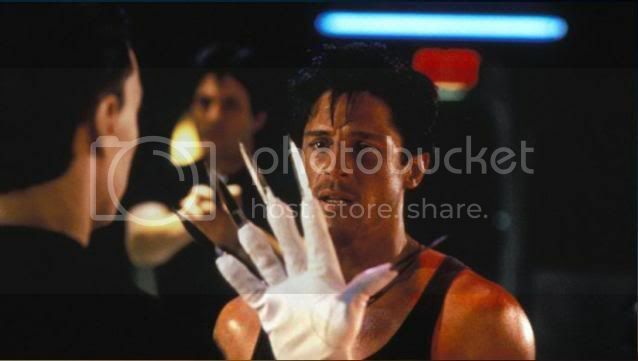 Do you think Larry could have afforded a real white glove? Or at least a CLEAN one? does he do a lot of high kicking and have a little pony-tail round the back of that lustrous pompadour? that rings some bells, but doesn't really narrow the field. is the heroic mullet a recognised sub-genre of the martial arts flick? I don't know too much about the martial arts genres. So I can't answer that question. But the person whose back is facing you, starred in many action movies beginning in the late 1980's. This movie was distributed by Vidmark. As I said it was distributed by Vidmark.